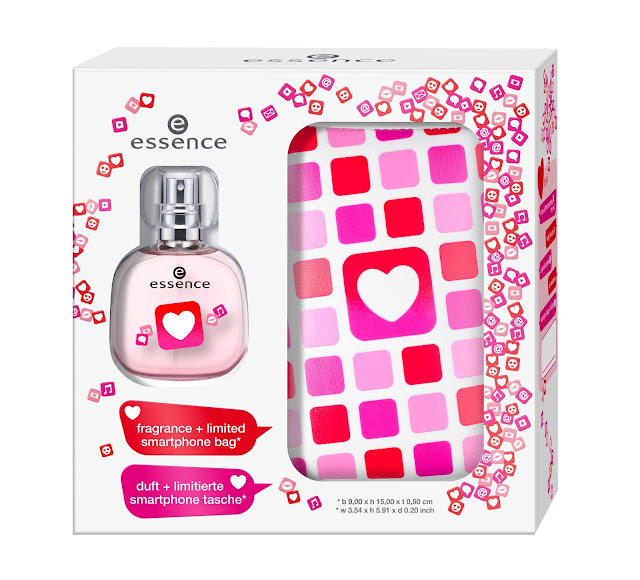 Preview: Essence #mymessage fragrance sets (Oct - Dec 2015) - Cherry Colors - Cosmetics Heaven! I don't usually share previews of Essence fragrances, but this time I decided to do an exception. Why? Because I like the new notes in them and the phone bags are a great idea! contain a stylish smartphone case in a trendy design with a zipper and an essence band. emoticon – are sure to take center stage. essence fragrance set – #mymessage love So in love! Sensitive, warm and unique – this fragrance makes you fall in love. Tangerine, grapefruit, raspberry and pear give the fragrance a fruity and sparkling head note, while red orchid, heliotrope and jasmine add a floral component in the heart note. The basis makes this fragrance truly special: dried timber, sandalwood, creamy caramel and musk come together in this wonderful composition. On top, the set contains a fashionable smartphone case. gives it a subtle sweet touch. On top, the set contains a trendy smartphone case. I like these tiny bottles with a cute and modern design and can't wait to give is a "sniff" once in stores. How abut yourself?